I wanted to play with watercolour and was having a hard time decided what stamps to use and trying to narrow it down so I finally decided on the I Like You set from Mama Elephant. I STILL had trouble narrowing it down so instead I made several mini cards from a sheet of watercolour card stock that I cut up with one of the dies from MFT's Wonky Stitched Rectangles STAX Die-namics (kind of obsessed with those lately if you haven't noticed). Here are some of the last ATC's I've made - these were all for the swap I hosted near the end of the A*Muse*A*Palooza competition. I was inspired by the cow ribbon I picked up at the Michael's $1 bin for this ATC. I had *just* enough for the 10 ATC's - there was less than 1/2" left!! 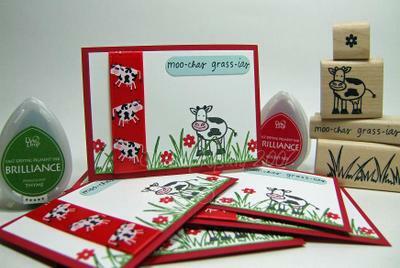 I stamped the cow first, then the grass and flowers using Brilliance ink (SO vibrant and rich in real life! ), then adding the sentiment (which was punched out with SU! 's Word Window punch). 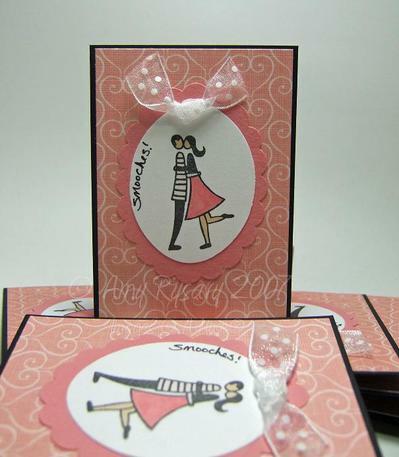 For this one I used the A Muse Kissing Couple stamp, and since I don't have their "smooches" stamp (YET - it's on my list to order when I use my gift certificate!) I wrote it myself with a black marker. I used the Marvy Super Jumbo (blue) oval and Mega (pink) Scalloped Oval punches, and added a bit of May Arts ribbon with a mini glue dot. The patterned CS is from Chatterbox, the scalloped oval is Prism CS, and I used my Copic markers to color in the images. 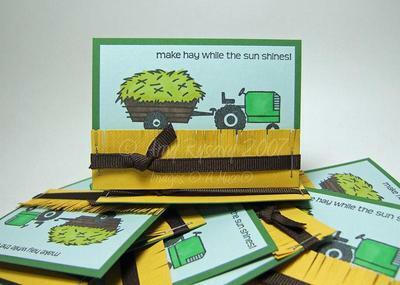 For this one I stamped the A Muse tractor and hay wagon onto Soft Sky CS and colored them in with my Copic Markers (that's one thing I really love about Copics as they color well even on colored CS's - you can see how well the yellow turned out). I made "hay" by cutting snips into the yellow CS using my paper snips - then attached it to the bottom of the ATC and tied on the ribbon which I attached with staples at each end. Lookie what's coming July 1st!! My Favorite Things Hit the Beach set will be available for sale that day - and is it EVER a cute set!! I used the set to make these 2 ATC's for the swap I'm in. For the first one I stamped the beach towel onto Bazzil Smoothies White CS, colored it in with my Copics, then cut it out. I used the speckled stamp from SU! 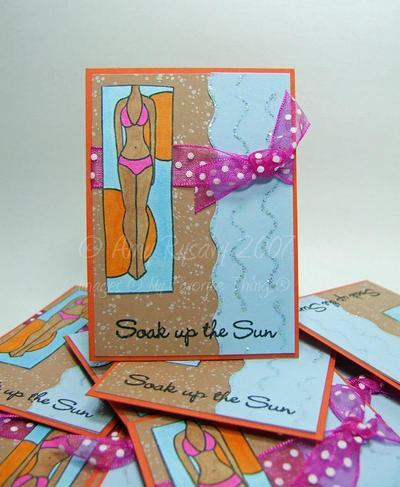 's Itty Bitty BG set with white craft ink to make "sand", and cut the Bash. Blue CS with Fiskars wave scissors and added icicle stickers to make the waves. To finish it off I added the sentiment and some May Arts ribbon (I used up the very last bit I had of it too - I need to get more!!) and that was it! 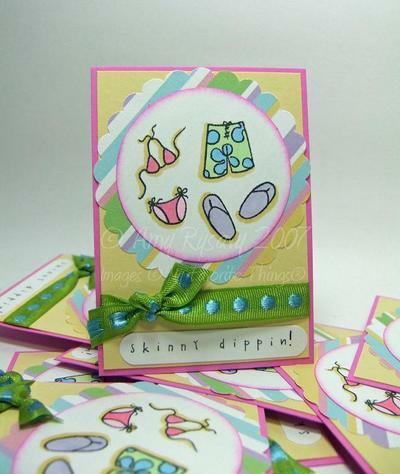 LOL I love how this second one turned out - I was just sitting at my desk looking at the stamps and the idea to make a "skinny dipping" ATC just hit me - and this was the end result! I used my Marvy Super Jumbo circle and Mega Scalloped Circle (with Rob & Bob patterned paper from one of those Michael's slabs) and colored in the images with my Copic Markers. The ribbon is from Michaels and the sentiment was done with my Karen Foster mini snap stamps (I hand lettered the exclamation point) and SU! 's word window punch. This set will be available July 1st from MFT's site, AllThatScraps and eP. I'm still having computer issues and it's taking me FOREVER to be able to post on here! I am anything but computer savvy but if this keeps on me thinks I'll need to take this darn thing in to get an expert to look at it! After several attempts to upload here are 2 Papertrey ATC's I did for the swap I was in. 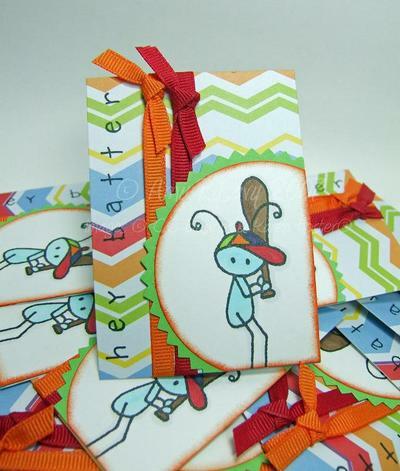 This first one uses the Little Lady and Faux Ribbon sets from Papertrey. I stamped the wings using Pretty in Pink Craft ink, then stamped the dots using Versafine black ink, and embossed them with Iridescent Ice embossing powder. They were then cut out and adhered over the black body and I added a black brad for good measure. On this one I used the Butterfly Kisses set - first stamping the "starburst" butterfly using Tempting Turquoise SU! Classic Ink, then stamping the dotted butterfly over it with Versafine Black ink (did you notice I added little antennae? I used the mini pair from the Little Lady set). It's prolly impossible to tell but I added Black Diamond stickles (that I got from StarLitStudio) to several of the dots as well as to the center of the Prima flower for a little added bling. I used my SU! oval punches for the sentiment (from the Faux Ribbon set) and that was it! I am having computer issues today - this is like the millionth time I've tried to upload this post! AURGH!! 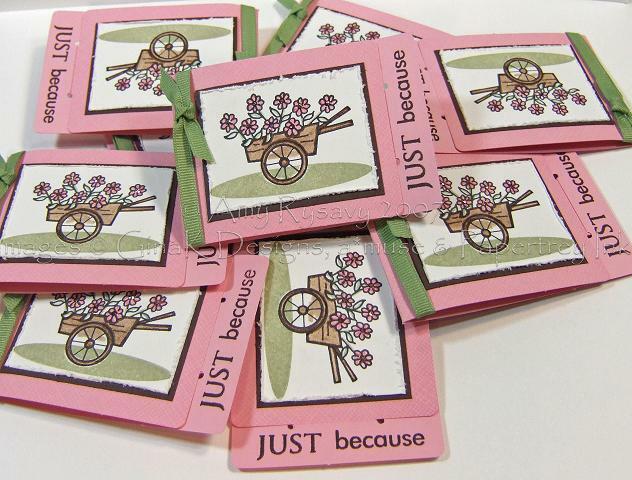 I also got all the new "In Colors" from a recent Stampin' Up! order - and used some of them on these ATCs! The base is the new Soft Sky (I LOVE it - so pale and really pretty - definitely my favorite! ), the circle the kitty is on is the River Rock (I thought it would be more yellow - it's cool tho - more khaki colored and I like it). I stamped the A Muse small skinny oval using Wild Wasabi ink (a nice green - I like that too!) onto the circle for the kitty to "stand on". The sentiment is also by A Muse. The kitty was stamped onto Bazzil Smoothies CS, colored with my Copics and cut out. All the fishies were stamped onto Soft Sky CS - I added a little color with a Copic marker - and also cut out. I used a craft knife to cut the kitty image then slipped the fishie in his "mouth" and held it in place with a mini glue dot. The patterned paper is from Chatterbox - I just pulled it from my stash and was pleased with how well it matched! I finished off the ATC's with a Close to Cocoa circle, some grosgrain ribbon and a couple of copper brads. Here are 3 more sets of ATC's I've done - this time all with stamps from A Muse. On this one I used this patterned paper as the base, adhered a Giga Scalloped Circle (SU Celery CS), then stamped the sentiment and added the prego dress with dimensionals. I finished it off with white dots from a gel pen, some ribbon and a prima attached with a Making Memories flower brad. 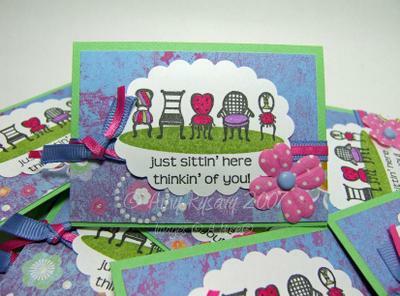 For this one I used a mega scalloped oval and stamped it with the A Muse Chair Line stamp, stamped the A Muse small skinny oval and the sentiment under it, then used my SU markers to color in the chairs. The patterned papers are from the Pocket Full of Posies DCWV stack - that's what inspired the color combo for this card. The Prima flowers are from this bra set - I just love that they have polka dots on them LOL! - and was attached with a jumbo Making Memories brad. 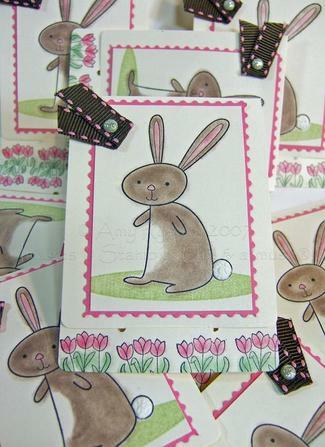 And last but not least is my "bunny bum" ATC (I heart this little bunny stamp!!). I used a giga scalloped circle that I stamped the image and sentiment onto, colored the bunny in with Copic markers, and added a line to help "ground" the image. I sponged the edges of the circle and adhered it to the ATC. 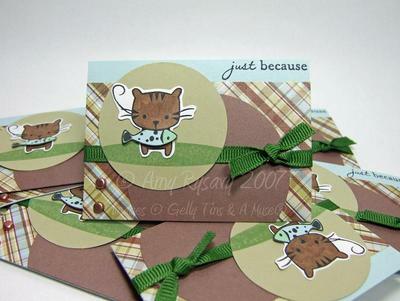 The patterned paper is from the Au Chocolat set that was in the Stampin' Up! 07 Spring mini. To finish it off I added some grosgrain ribbon and a couple of Prima flowers attached with vintage metallic brads (I don't know the brand of them as they were given to me in a container that wasn't labelled). I stamped the Play Ball Bug onto Bazzil White CS, used Copic Markers to color him in then punched him out with my Marvy Mega Circle punch and sponged the edges. My mother in law let me borrow her pinking shears (out of all the Fiskars paper edgers I have (did YOU get sucked into buying the carousel of them at Costco b/c it was such a great price and then never used them? LOL!) not one has an edge like this!) as I wanted to mat the circle with an edge that matched the patterned paper. The paper by the way is from this DCWV stack - I just got it last week and LOVE it! There's boy papers and girl papers and zoo/animal papers and most are either embossed or have glitter on them! FUN! I used the small Karen Foster snap stamps to make the sentiment, added some ribbon and that was it! I dunno what it is but I really have a thing for Pirates lately (and yes I went to see Pirates of the Caribbean 3 and fully enjoyed myself!! I *heart* Johnny Depp........'nuff said!). 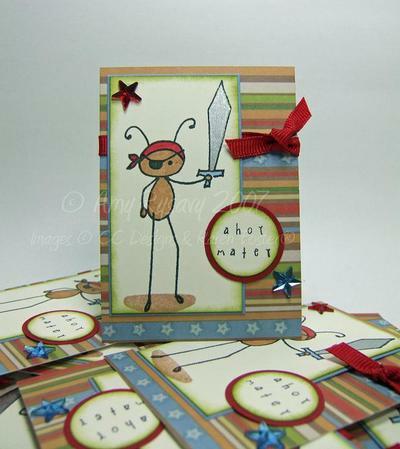 I stamped the Ahoy, Matey bug onto Very Vanilla (Stampin' Up!) CS, along with the shadow spot, and used Copic Markers to color him in. To make the sword silver I used a fine-tipped silver metallic prismacolor marker. 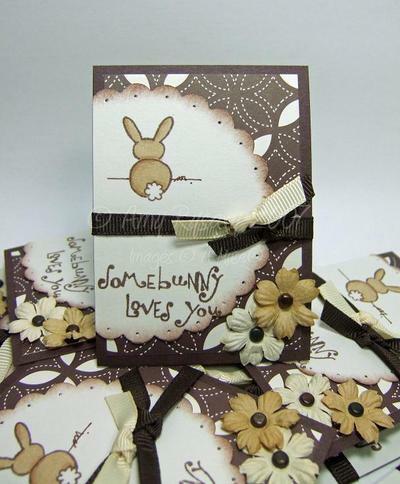 The sentiment was done with the mini Karen Foster snap stamps, punched out then sponged. The stars are from this KI Memories Color Lab set and I attached them with mini glue dots. 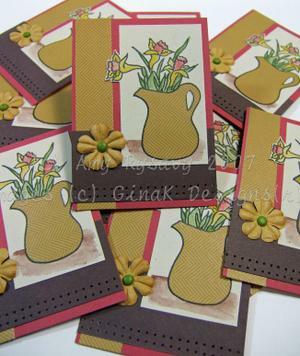 Here's a couple more sets of ATC's I've done recently - this time with some of my new GinaK Designs stamps. This one was inspired by this card I made earlier this month. The pelican was stamped on Bazzil Smoothies White CS, colored in with Copic markers, then cut out. I used my Mega Marvy Square punch on the patterned paper, and the Giga Scalloped Square on the Bazzil CS. The sentimeny was stamped using Versafine Onyx Black ink - I have yet to be able to use this ink for images that have to be colored in (it ALWAYS smears when I start coloring no matter how long I leave it to dry!) - but it's AWESOME for just stamping something in black like I did with the sentiment. It's a really BLACK black ink. All the CS for these ATC's is Bazzil (sorry I don't know which colors - I have swatch-books on their way here to help me with that LOL!! Bazzil has a TON of different colors! ), and the ribbon I got from a ribbon share Jody did some time ago. On this one I used Gina's Seafood Surprise stamp - again stamping it on Bazzil Smoothies CS and coloring it with Copic markers. 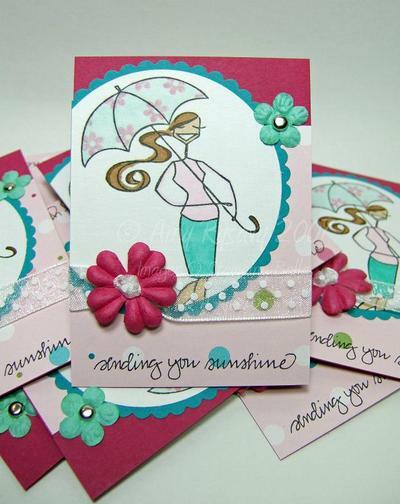 I created the scalloped edge with my Stampin' Up! Slit Punch, and the sentiment was punched out with my SU! Word Window Punch. The card stock and eyelets on these ATC's is SU! The ribbon is from the same ribbon share from Jody. I stamped the Bella onto Bazzil Smoothies CS, punched it out with my Marvy Mega Circle Punch then reverse-masked the umbrella (I stamped the bella onto a Post-it, then cut out JUST the umbrella top from the image, then placed the whole Post-it over the stamped image) and re-peatedly stamped the Tiny Daisy with dye ink. I wasn't sure if it would work but I tried coloring the rest of the umbrella with a Copic marker and it didn't smear the ink! I LOVE how it turned out! I also used Copic Markers to color in the Bella. I used Fiskars Scalloped Scissors to make the scalloped border around the bella (I just adhered the white CS to the Teal then cut - totally eyeballed it! 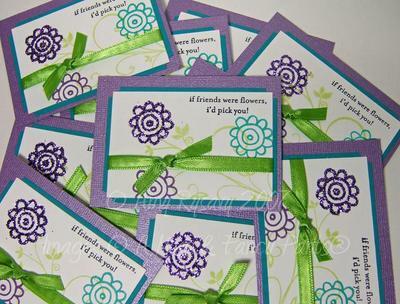 ), and added a couple of Prima flowers and some May Arts ribbon. The patterned paper is from Stampin' Up! 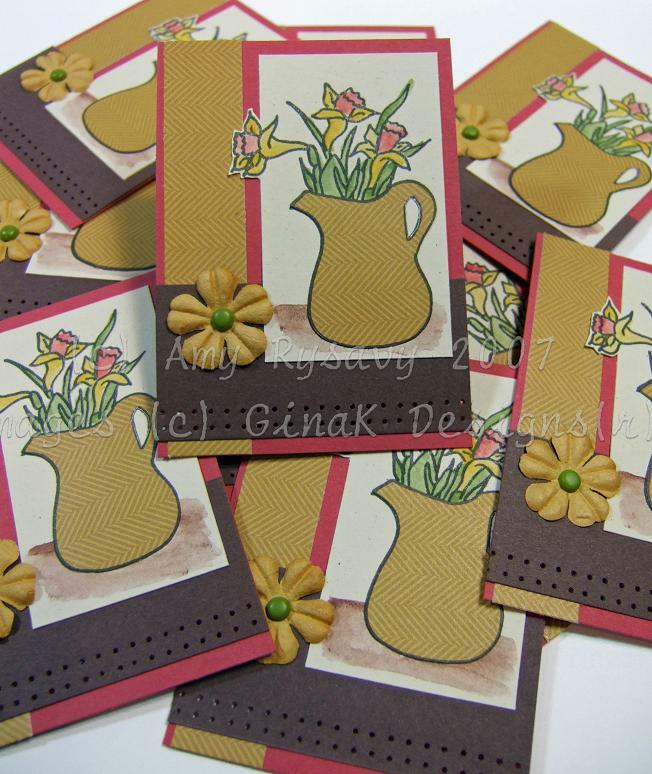 's Petals & Paisleys DS Paper (from the 07 Spring Mini) and was the color inspiration for these ATC's. The base of the ATC is Rose Red SU CS and the scalloped mat is Taken with Teal SU! CS. 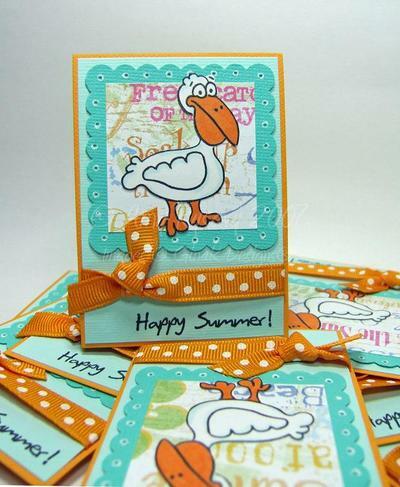 OMGosh I just saw on Em's (THE Stamping Bella herself) blog that she has removed beachabella (the one I used here) and replaced her with kinibella (which is stinkin' cute and I want it!). So I thought I better post this NOW!! I had that song running through my head when I made these so of course I ran with it. I used Copic markers to color her in - using the color "Sand" on her skin to give her a good tan <grin>, and then added the polka dots with a white gel pen. The oval was made with a Marvy Mega oval punch, and I used scalloped scissors on the Pumpkin CS (I did that instead of the Giga Scalloped Oval punch b/c it would take up too much space on an ATC since I only have 2.5x3.5" to work with). The patterned paper is from (what else?? LOL!!) the Hit the Beach collection by Flair Design (I bet y'all were hopin' I had moved on from that stuff hadn't you?? Fat chance...........I really adore that paper........*wink*), the ribbon is by May Arts, and the jumbo brad is Making Memories. The sentiment is by GinaK from the new Summer 07 release - was perfect for these!! Em if you see this I REALLY hope you change your mind about retiring Beachabella - I can totally have both her and Kinibella (can't we all??). I finally got a chance to sit down and make my ATC's for the A Muse ATC swap I hosted!! So here they are! The sentiment and Daisy Doodle stamp are A Muse, and the green flourish image is from the ginormous Fancy Pants clear Pollen Brush set (I got that at my local scrapbook store months ago and this is the first time I've used it!). I used VersaMagic inks for the flourish and the flowers (Key Lime, Turquoise Gem and Purple Hydrangea), and did the one flower in Heat and Stick powder and poured on purple Making Memories glitter. The ribbon is from Michaels/WalMart, the Teal CS is Stampin' Up!, and the ATC base is Bazzil Bling CS (I wanted to use something shimmery to mimic the blinged out flower :o)). OK this is the LAST ATC I'll be posting (for a good while at least!!). Altogether I did 8 different designs/10 of each design (so yes 80 ATCs!!) so I am VERY glad to move on to other things *grin*. I love this little Bunny set in the Stampin' Up! Spring Mini - tho I wasn't planning on getting it (I have SO many stamp sets now and am *trying* to limit myself -but Lauren MADE me get this one *waves at Lauren* - so it's all her fault!). Are you all sick of my ATC's yet?? LOL I promise after the *next* one I'll lay off for a while LOL!! After this one I have one more to share - I had to make 8 different designs for the swap I'm in and this is #7!! 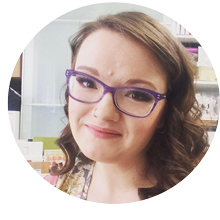 Also I wanted to try something different on the blogging front - I know some people just want to see the projects and not read my (rather lengthy at times) blabbing about them (and I don't blame them either *wink*) SO - if you wanna know more then you just click on the link!! And if not then you can just leave it and scroll down to my other stuff *grin*. 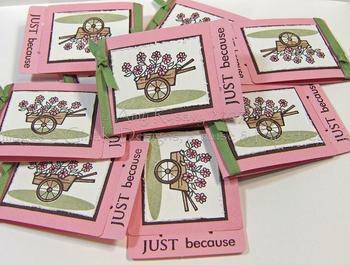 The flower wagon stamp is a new one by GinaK from her Spring release - you can see it here. It's stamped and colored in w/ SU! markers, then I added dabs of Coffee Ice stickles to the flower centers (got that from StarLitStudio). The wagon was of course stamped then masked so I could use my very muchly *hearted* a*muse oval. The sentiment was made using the Papertrey Paper Tray set (don't forget to keep an eye on Nichole's blog as she counts down to the release of the new set on the 15th - one week from today!!!). I'm not sure if you can tell from the picture but I also used the Weave BG (by Cornish Heritage Farms) on the front part of the Pretty in Pink Love Notes (which were from the now-over SU! Winter Mini - they are the exact size of an ATC so I thought I better start using them up!!). STAMPS: Flower Wagon by GinaK Designs, Small Oval by a*muse, Sentiment from the Paper Tray set by Papertrey Ink, Weave BG by Cornish Heritage Farms. CS: Pretty in Pink Love Notes, Whisper White, Chocolate Chip. INK: Basic Black Classic Ink, Mellow Moss, Pretty in Pink, Regal Rose, Chocolate Chip and Creamy Caramel Markers, ColorBox Fluid Chalk Ink in Dark Brown. ACCESSORIES: Moss Grosgrain Ribbon, SU! Cutter Kit, Coffee Ice Stickles. Here are a couple more ATC's I made for the swap I'm in (if you click on the ATC Category there on the left you can see all the other one's I've done so far). This one was based on this card I did not too long ago. 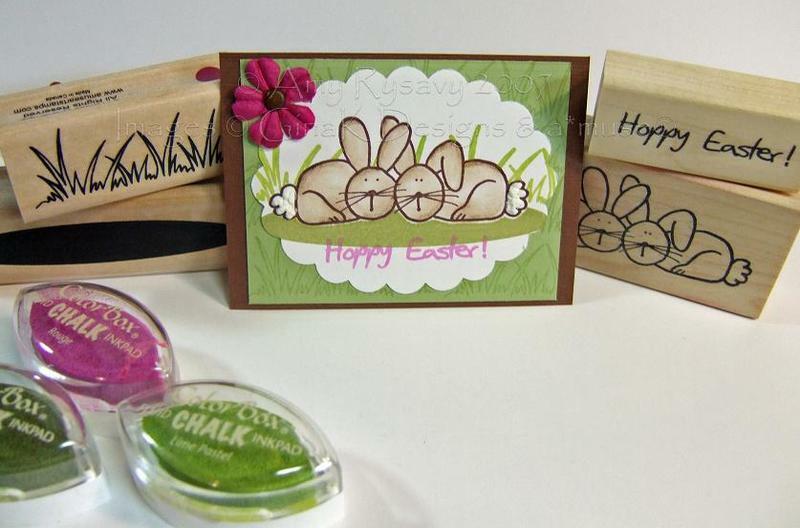 I stamped the GinaK Designs Daffodils stamp onto Naturals Ivory CS, watercolored it w/ Watercolor Wonder Crayons, and cut it out. I then re-stamped the jug onto this piece of patterned paper by Pixel Decor, cut it out and glued it on top of the watercolored image. To finish off this ATC I added a small strip of the same paper, some pierced Chocolate Chip CS and a Prima flower (attached w/ an SEI brad). The base of the ATC is Ruby Red CS. 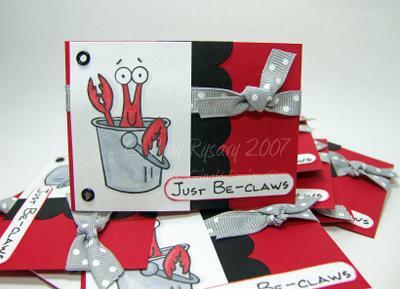 The inspiration for this ATC came from this card. I used the same fabulous Daisy D's paper that I got from AllThatScraps. An ATC is too small (they measure 2.5" x 3.5") for me to use the flower trio stamp that I used on the original card, so I used this little flower vase stamp by GinaK instead. I stamped it onto Shimmery White SU! CS (using Black StazOn) then punched it out w/ my Marvy Mega Scalloped Oval Punch. I masked the vase and stamped the a*muse small oval and then watercolored the image and pierced around the edges. 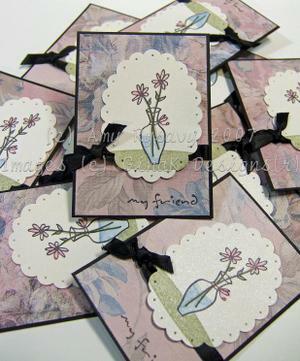 I stamped just the "my friend" part of this sentiment and added a little black ribbon (from Michaels).